Many years ago, back in the late 1970s, I was privileged to take part in the final phase of Eric Knowles' Madasahatta campaign. Full details of this epic undertaking can be found on Bob Cordery's Colonial Wargames website - including such things as the maps, orders of battle and copies of the campaign newspapers. It was huge fun and for the uninitiated was a 1914 era campaign set on the African island of Madasahatta - loosely based on Madagascar. The armies were a mixture of colonial overseas troops, local levies and the various indigenous tribal types and with a suitably inspiring dramatis personae - you will have to look at Bob's website for more details of this particular facet! 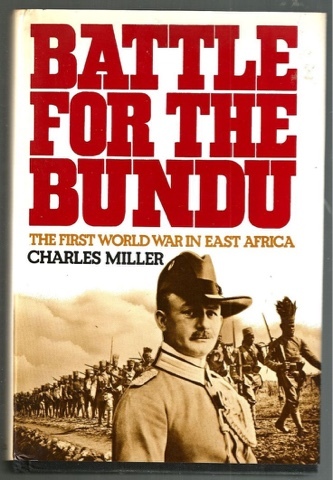 Battle for the Bundu by Charles Miller is the story of the German East African campaign of the Great War under the command of Colonel von Lettow-Vorbeck - which also includes the naval campaign on Lake Tanganyika as well as the Konigsberg affair. After the German cruiser had been sunk her 4.1" guns were salvaged and saw further action under Lettow-Vorbeckand. Let us also not forget the ill-fated dirigible L 59 sent to bring much needed supplies to the German forces. The Germans were not defeated and remained under arms until after the armistice and Von Lettow-Vorbeck became something of a celebrity to both friend and foe. I believe that much of this campaign provided Eric with the inspiration for Madasahatta and so I am delighted to have finally gotten hold of a copy - especially as my previous version seems to have disappeared from the face of the earth! Would I game this campaign? Well I have a very good boardgame based on the East African campaign so the map side would be well taken care of. There are some very nice figures around in a variety of scales but for my money my preference would be for 10mm as Pendraken have a pretty good range for this conflict. In fact, a number of years ago I had planned to do just that with an old gaming friend from SEEMS - my local wargames club. I have just returned from a very restful week away with SWMBO to the Canary Island of Fuerteventura. It was a week of superb weather, good food and drink and above all - rest and relaxation. From a gaming perspective I managed to finalise a few ideas and also read Churchill's Secret Warriors by Damien Lewis which has certainly given me much food for thought - do any readers know of a good set of simple special forces rules for the WW2 era? The bulk of the book covers the Eastern Mediterranean which is a particular favourite of mine as a gaming setting. Very inspiring and chock full of derring-do. There are some great ideas for games contained therein but figures may be a little tricky. The Germans or Italians should present few problems but the raiding forces may present a challenge. Certainly one to think about and no, this is not a new project - rather a twist on an existing idea! I also came home to a rather special parcel I had been waiting for - more of which in the next post! "It had rained all night. At dawn, in the fields of rye along the southern edge of the forest of Soignes, you could hear a murmer like the sea on a distant shore.This was the blended voices of 67,000 men, grumbling, yawning, shivering, stretching cramped limbs, joking as people do when they share discomfort, and arguing about what would happen next: not about what Napoleon would do or what the Duke would do, but about more pressing problems: where to find something dry to light a fire, where to look for the wagons with the gin rations, and whether there was anything for breakfast. It was the dawn of Sunday, 18 June 1815." So begins A Near Run Thing by David Howarth, published by Collins in 1968. It is one of the most influential books in my library and even now, after some forty odd years and countless rereading it still has the power to enthral. Although my wargames tastes have evolved since those halcyon days of pocket money priced boxes of Airfix figures and the inevitable magazine inspired conversions reading this book is sufficient to transport me back to when my games were simple, uncluttered and above all, fun. The book is not a detailed blow by blow account of the battle - there are only a few basic maps and not a single order of battle - but what it lacks in technical analysis in makes up for in the human dimension. From the words of some of those who were there - Wellington, Napoleon, Lord Uxbridge, Captain Kincaid, Corporal Dickson, Colonel Ompteda, Lieutenant Graeme, Sergeant Morris, Sergeant Lawrence, Lieutenant Gronow, Captain Mercer, Sergeant Wheeler, Ensign Leeke, Private Clay, Cadet Larreguy, Captain Robinaux, Lieutenant Martin and Marshal Ney - come the voices of history, immortal and inviolate and our understanding of those momentous events is the richer for it. For myself I know what the Battle of Waterloo has meant to me in terms of my hobby and the path it has followed but it would be wrong if the intervening 200 years dimmed the human dimension of those cataclysmic days - of the lives lost or changed by injury or the political repercussions of the outcome decided on a small Belgian field - and the words and memories of those that were there were allowed to recede into history. How ever you choose to honour the day, be it via a game based on the battle, watching Waterloo again, listening to the soundtrack, painting some figures, discussing the campaign or visiting anything that features the anniversary - even raising a glass of J.W.Lees Victory at Waterloo bitter (and very nice it is as well!) spare a thought for those thousands of people that took part in history all those years ago and smile to yourself as you do. Time and distance should never lessen the impact of their story. Last Sunday was the Broadside show down in Sittingbourne in Kent and organised by those splendid chaps from the Milton Hundreds wargames club. It is an easy hop across the river and a 40 minute drive from me somit is a show I like to attend. It also has the virtue of being relatively compact and with a good selection of trade stands. Finally it is a great opportunity to catch up with gaming friends and see what they are up to. Sadly I am unable to add to the enormous number of photos of the various games at the show simply because I only took a few and if I am honest they are pretty much more of the same of what has already appeared on a host of other blogs. I caught up with Postie's Rejects (always good for a laugh) and a very nice looking Border Reivers game and SEEMS where Messrs. Fox and Habron seemed to have more Star Wars ships in evidence than you could shake a Sith Lord at for what would have been a truly epic X Wing game if they had all been used at once! I spent a lot of time chatting and helping to set up the stall with Dave Lanchester the military book dealer and, unsurprisingly, a certain amount of cash as well. The expenditure was fairly modest and limited to a book from the flea market - The Wargamers Guide to the Crusades bu Ian Heath, a couple of tomes from Dave Lanchester - Tigris Gunboats and Rome in Crisis (covering the wars and rise of Marius during the late rebublic) and an interesting set of rules called Trireme Commander produced by Capitan Games. The latter are also producing a set of laser cut MDF10mm scaled galley models, one of which was included with the rules as a show deal. This will be supported with the appropriate crew figures currently being readied. They are also producing a similar range and set of rules for small ship actions during the age of sail which looked equally interesting - one of the clubs was demonstrating such an action using the rules and models and it looked very impressive indeed. It was a good show and as ever it left me feeling inspired which is something I have badly missed over recent months. It also served to harden my resolve as to how I will be tackling my own projects going forward because at the end of the day we all do what we do because we can. Over the course of my Wargames career must have tried umpteen set of rules - ranging from the sublime to the ridiculous. I have used rules that are incredibly complicated (and have had the headaches to prove it) and those that are incredibly simple - as I suspect most readers of the blog have at one time or another. As part of my ongoing and angst ridden struggle to decide on that which floats my boat in the best possible way from a Wargames perspective it crossed my mind that perhaps this is a question that many gamers can relate to - what are your favourite rules and why? For myself as it stands at present the two types of rules are probably unsurprising - namely Command and Colours and DBA. It is easy to see why. Both sets are readily usable for a variety of periods and still yield very gameable results - using DBA as an example who would have thought that they could have been used (and abused) for so many different periods? Clearly this is a set of rules of no common clay! The same could be said of Command and Colours. I am going to put this challenge out into the Wargames ether. I would love to hear about your top 5 sets of rules (and why) and to set the ball rolling mine are listed below. There are no prizes as this is just a little bit of fun. These are in no particular order as this is not a poll as such. 2. Battle - often imitated but the original probably did more for WW2 gaming than anything other set I could think of. 5. Ship of the Line - these were the rules that inspired Wooden Ships and Iron Men. The combat and damage system for naval combat was absolutely first class and spawned a host of other sets. Significantly the authors of three of my top five are no longer with us but their legacy lives on. These are very much my personal choices so I am not looking for criticism! It would be fun though to hear about other gamer's choices. Way back in the early 1980s when I first began gaming at the Newham Wargames Club there was a lot of interest in 6mm ancient wargames using WRG 6th edition. There were numerous armies around ranging from Sassanid Persian to Seleucid via late Byzantine and many others besides. There were also armies in 15mm and 25mm (28mm as it became). In fact the first ancient army I owned was a 25mm Carthaginian army with figures from a variety of manufacturers. Under 6th edition it weighed in at nearly 3,500 points and was huge. It was great fun to use although it was a struggle to win with it - I tended to consider having had a good game if I managed to fight the opposition to a standstill! To cut a long story short I abandoned ancients when the 7th edition came along - not due to the rules but at the time a number of things were going on in the real world that derailed my gaming for a while - and only really picked it up after a fashion when DBA appeared. I flirted briefly with the naval side - as I recall using a set of rules called Diekplus - but not to any great degree. I must confess to having a soft spot for ancients and with the Carthaginians in particular and I have often considered dabbling once again in the second Punic War. 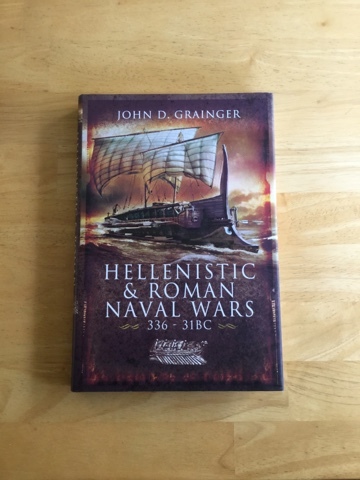 The wars of the Roman Republic from Hannibal up to Mark Anthony's final defeat at Actium in 31 BC have long fascinated me - more so than wars of the later empire - and I have a modest library covering the era to delve into as the mood takes me. The title you see above is one such volume and it is a cracking good read. The naval side of this era was very active and it would not be too difficult to cobble together some forces to game with. I have a selection of galleys that could be used readily enough - if you recall I was toying with something Salamis related a while ago - and as a quick fix it has much to commend it. Ironically there is DBA ancient naval version kicking around the net which would mean even less work to get the forces readied for action. As far as the land side is concerned the prospect of using Command and Colours with figures is tempting (and Tim Gow of Megablitz and More fame has featured this on his blog on many occasions) but would probably need more figures than I would prefer to acquire. DBA is another story though. In my last post I had mentioned that I had taken the plunge and had joined the Continental Wars Society covering the European military scene from Waterloo to the outbreak of the Great War and had also acquired the disc containing issues 1 to 69 of the Foreign Correspondant - the quarterly journal of the society. My first issue and the disc duly arrived and a couple of nights ago I uploaded the contents onto my IPad. My morning commute has been like a succession of Christmas mornings! Russians versus Caucasian tribal types - I really liked the look of this one! It is a veritable smorgasbord of military 'stuff' and you may be forgiven for thinking something along the lines of how on earth is he going to make his mind up from that little lot? Well, strange as it may seem what this 19th century immersion has done is to help me frame what I want to do in some form of context. I have some ideas to tinker with but for now I merely soaking up the inspiration.